Your team may be a competitive bunch who enjoy a glass of wine but are they up to the challenge of The Wine Apprentice? It's an afternoon team building activity that revolves around wine tasting and is perfect as part of an away-day or an off-site team meeting to provide some relaxation and much needed fun! The session kicks off with an introduction to wine tasting and an insight into how wine is marketed with two wines tasted with the group. We then give each team a different bottle of wine and brief them on a series of wine tasting and marketing tasks to complete during a break out session - all while enjoying a glass of the wine. Tasks range from writing a tasting note to devising a brand name and an ad. The more outlandish, the better! Once the tasks are completed each team presents back to the group and to a panel of judges, while sipping Champagne. Extra points awarded for creativity, humour and flair with a prize for the top team at stake. Great fun for sales and marketing teams or any team with a highly competitive streak. Ideal for groups of 15-40 in teams of 4-6 people, the tasting takes about 3 hours and works well as an afternoon activity to end the day or to precede dinner. The Wine Apprentice is priced from £45 per person excluding VAT. 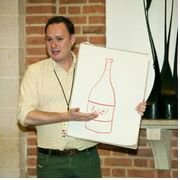 Hi Jane, Just a note to say thanks very much for the Wine Apprentice event yesterday – everyone had a really great time and the feedback I’ve received today is excellent – the mix of wine tasting and group involvement was perfect!